Once all the plants were in, the garden still needed something. First thought: a grouping of native lichen-covered boulders. Second thought: how the heck would my 78-year-old Dad and I pull off a boulder placing project (I am quite the pencil-neck). Then: DOH! How about some art? I’ve been telling people I’m an artist; here was a chance to make good on that claim. What the garden needed was something vertical and fairly big to add visual weight and to provide a link between the large existing maple tree and the low growing grasses and perennials that we just planted. A sculpture, weather proof, subtle to respect my Dad’s complete lack of ostentation. And something that would be specific to this particular garden. To generate ideas, I spent a bit of time brainstorming and writing with my left (non-dominant) hand. In her inspiring book, Visioning, Lucia Capacchione discusses how this technique can greatly improve access your right brain and subconscious. I’ve been using it for several years for everything from garden design to portrait paintings and am always amazed at the unexpectedly creative results. For this project, I wanted to develop a concept that would reflect my father’s love of sailboarding. Yes, my Dad – who hosts two prosthetic knees – is a big-time windsurfer. 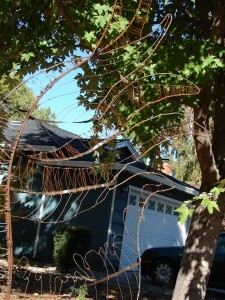 My right brain took the idea of a sail-inspired wire sculpture and ran with it. The final sculpture has the basic form of a sail, sort of, with a mast and metal strips that suggests the ribs of the sail. My right brain thought I should play with the shape to suggest a wing with ‘feathers’ of bent wire to reflect my Dad’s career as a pilot as well as to refer to a seafaring bird, the Royal Tern, that visits my dad’s favorite windsurfing mecca, Bonnaire. And, add abstracted wave patterns to reinforce the windsurf element. The whole thing is made out of twisted metal, much of it salvaged, with no welds. 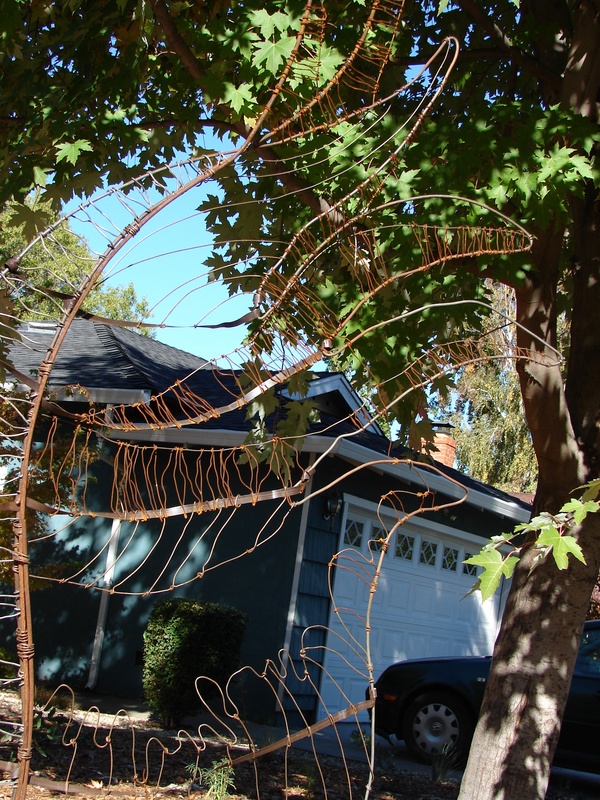 The wire and rebar had to be thin enough for me to hand bend so the piece has a very light, open appearance that, with its gentle rust color, does not overpower the garden in spite of its 7′ height. 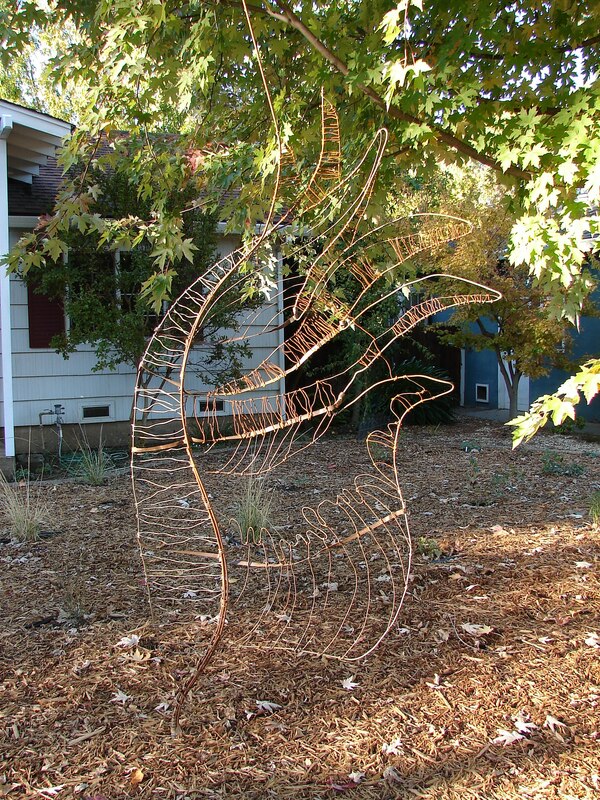 This entry was posted in New Projects and tagged aviation art, eve werner artist, Eve's Garden Design, garden art, metal sculpture, salvaged metal sculpture, sculptor in chico, site-specific art, site-specific sculpture, windsurfing art on November 1, 2010 by admin.